Cover shot for ScanBike magazine’s December 2008 issue. Kai from Norwegian rock’n’roll band The Carburetors appears because of article inside, including this old favourite. Models: Vibeke and Kai Kidd. 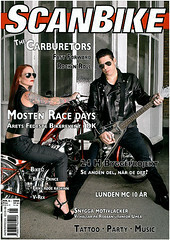 This entry was posted in Photography and tagged cover shoot, magazine, MC, media, ScanBike, The Carburetors on 2008-11-28 by Espen Stranger Seland. I think I missed this edition. Anyways, I’m not a big fun of bike but the cover was beautifully shot. Cool!